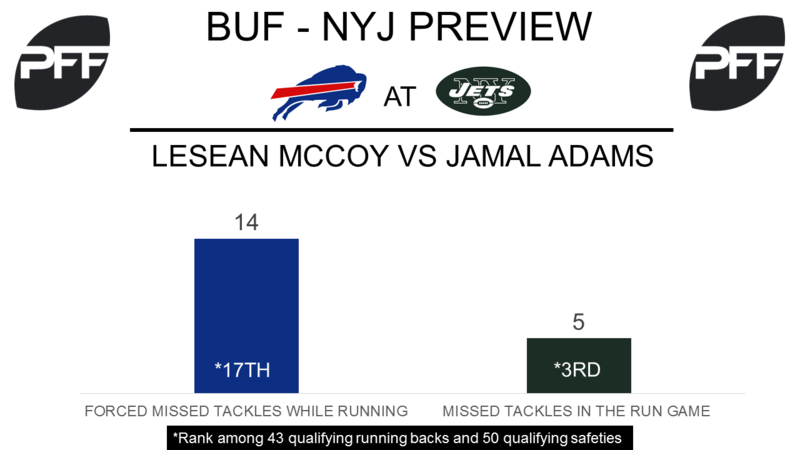 RB LeSean McCoy vs. S Jamal Adams – In the run game the Jets will likely try to fill the box with safety Jamal Adams to limit McCoy’s production. Adams has spent 84.1 percent of his snaps within eight yards of the line of scrimmage, the ninth highest rate among safeties, and while he has the ninth most stops (9), he also has missed four tackles within eight yards of the line of scrimmage, the third most among safeties. McCoy continues to get better, earning a season high game grade of 87.7 against the Raiders. McCoy has forced the 17th most missed tackles this season when running the ball, his forced missed tackle rate of 13.2 percent is just below the average of 15.7 percent. G Richie Incognito vs. DI Steve McLendon – Another key battle in the run game will see Incognito, the ninth-highest graded run blocker this season with a run block grade of 80.5, face-off with the 27th highest graded run defender in McLendon. Incognito has been superb blocking the run this season, his 15.9 percent of positively graded blocks in the run game is well above the average of 10.6 percent for guards this season. McLendon has one of the best run-stop percentages in 2017, his mark of 13.4 ranks sixth among interior defenders. He has complied 15 stops in run defense on his 112 run snaps (a run stop is a tackle made in run defense that results in a “WIN” for the defense). WR Jordan Matthews vs. CB Morris Claiborne – Matthews is having his worst season as a pro, his PFF overall grade of 51.5 ranks 82nd among receivers. Despite this he seems to have found a strong connection with quarterback Tyrod Taylor, and he has a wide receiver rating of 126.5 when thrown the ball by Taylor, the eighth best rating among receivers with at least 15 targets. Matthews will be in for a tough matchup against Claiborne, a player who is only allowing a passer rating of 64.4 when quarterbacks throw into his coverage and he is only allowing 55.3 percent of targets thrown his way to be caught. It’s worth noting that it is currently unclear whether or not new receiver Kelvin Benjamin will play. WR Jermaine Kearse vs. CB Shareece Wright – After a strong start to the season, Jermaine Kearse has fallen off as of late, and he has seen his overall grade slip down to 59.3, which is 73rd out of 109 qualified receivers. He will look to get back on track against Shareece Wright, who is currently allowing 1.87 yards per coverage snap, which ranks 102nd out of 109 qualified cornerbacks. He is also one of the most picked on corners in the game, as he is targeted every 4.6 coverage snaps, which is tied for the fifth most among those 109 cornerbacks. T Kelvin Beachum vs. Edge Jerry Hughes – Hughes has had an exceptional season off the edge thus far, as his overall grade of 87.5 is 10th out of 108 qualified edge defenders, and his run-defense grade of 90.3 is second only to Khalil Mack. Kelvin Beachum will have his hands full with Hughes, though he has been the Jets best offensive lineman this year, as he ranks 12th out of 73 qualified offensive tackles in pass-blocking efficiency at 96.4. This will be a very intriguing matchup to keep an eye on in this contest. 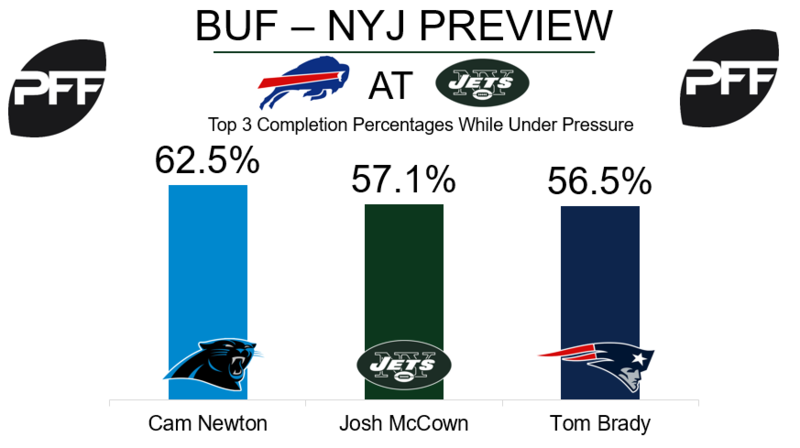 QB Josh McCown vs. S Jordan Poyer – McCown has had a lot of success with the deep ball this season, as his passer rating of 115.4 on passing attempts targeted 20 yards or more downfield is fourth best in the NFL. He also has thrown for the ninth most deep passing yards with 397 and has a very nice touchdown to interception ratio on these throws of five to one. Jordan Poyer will look to keep throws in check and continue his stellar season. Poyer’s overall grade of 87.7 is tied for the seventh best mark among 83 qualified safeties this season.